The Oregon Scientific SmartGlobes are traditional globes with a 3D AR twist and we've been sent the Starry 2in1 Day and Night Globe for review. 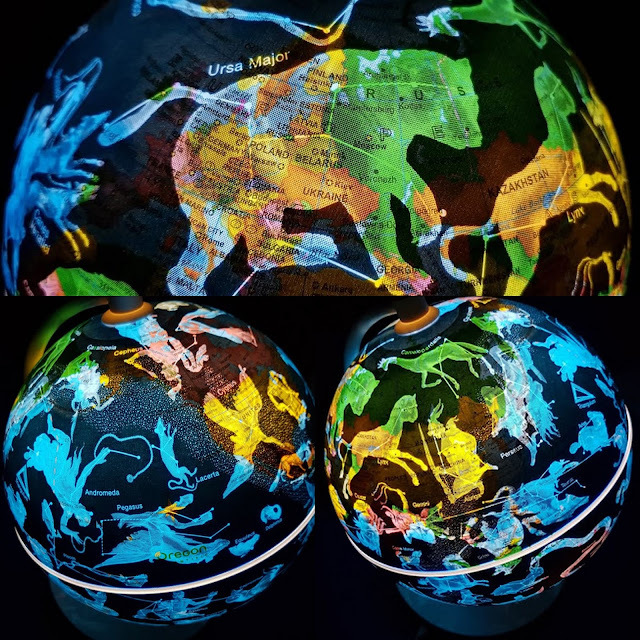 The globe contains a light and when you turn it on, you can see 88 constellations superimposed in position over the Earth. There is also an accompanying free app. with thousands of facts about Earth and beyond. 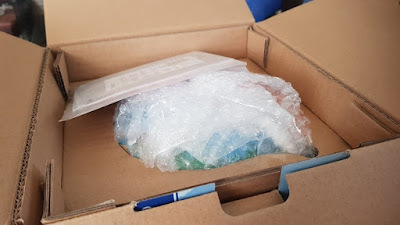 There is quite a bit of plastic protective packaging in this box, but it's very quick to open. Inside you have your globe and it's base. You will need either 3 x AA batteries or a USB charging cable and power source to operate the light as they are not included. 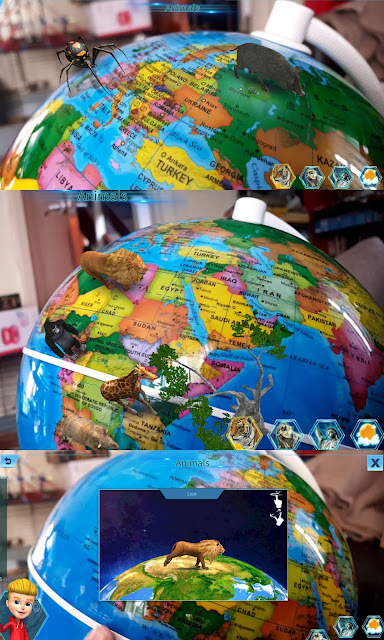 The globe itself is nicely made and the images are very clear. Printing seems perfect. It really pleased my 9 year old and he couldn't wait to start trying to find familiar countries. When you turn on the light, the constellations are visible. Obviously in a brightly lit room they aren't super-clear except over the sea, but they're still bright enough to see. This is great as it allows a real sense of proportion and placement. 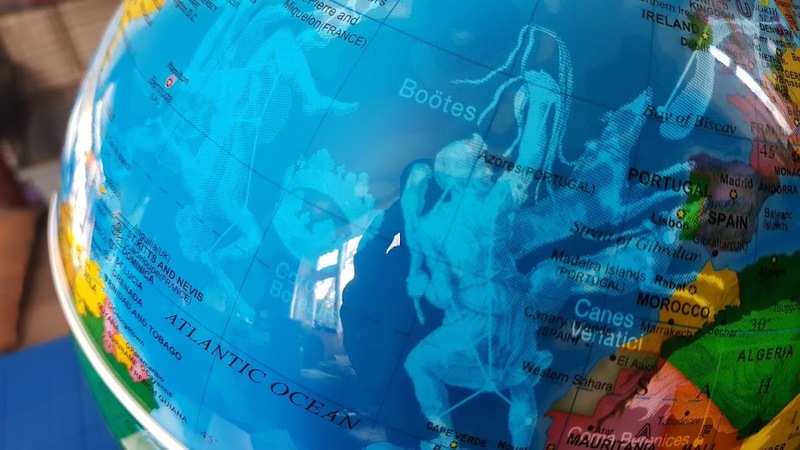 In the dark, the constellations are very easy to see, and they are coloured by the countries below, so it's still possible to find your location of choice. As a child I always wanted my own globe. I was fascinated by planets and felt that a globe would be an amazing addition to any bedroom.My 9 year old son is also fascinated by his globe. He thinks it's brilliant and is using it as a light while he goes to sleep. He particularly likes it when you turn it to 'the colourful side'. The globe really comes to 'life' with the app. 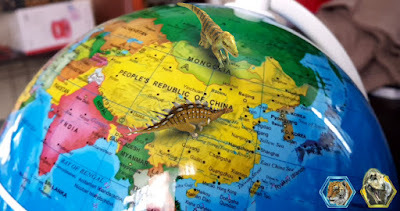 This has several different modes in 4 themes - Animals, Dinosaurs, Landmarks and Locations. The first thing anyone does when they try an app like this is look for their own home. I'll be honest, there was disappointment all round to find no animals, dinosaurs, landmarks or weather over the UK. 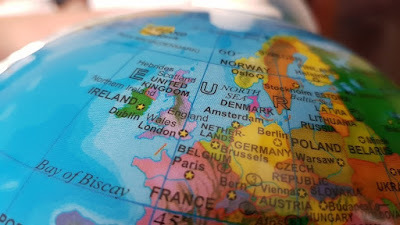 The UK may not feature in that part of the app., but worldwide there is still plenty to look at! 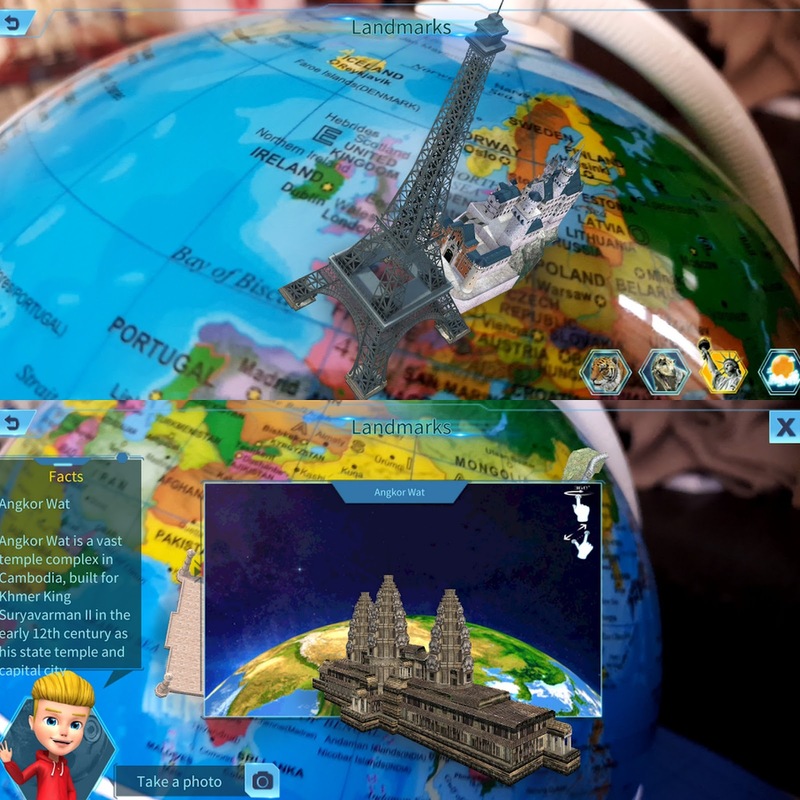 Everything can be clicked on for further information, so your child can learn the significance and history too. There is country information for 195 countries and the UK is included in that, although it is a bit like a passage from a 1950's picture book! 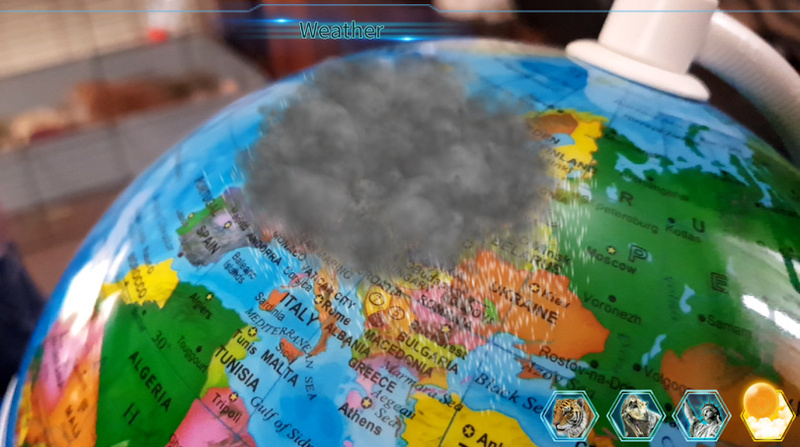 As the information is all via the app. it's updated and added to regularly. I suspect that now they have started selling in the UK, our entry may get an update sometime soon. There is also a quiz mode on the app. and it's actually very tricky! 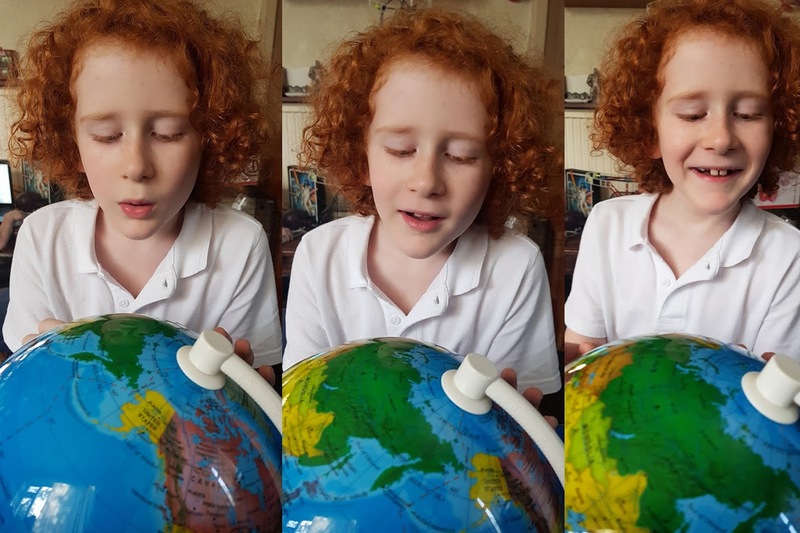 Questions are about constellations, space, planets, animals, dinosaurs and features of the Earth, and I've not managed a good score yet. I have to admit I was a little disappointed that the globe doesn't throw the stars onto the walls and ceiling, it is more of a desk lamp. 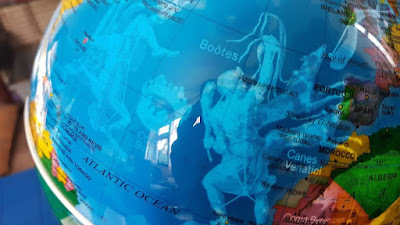 It was also a bit of an initial disappointment to find no dinosaurs etc in the UK, but we already know about the UK anyway, it's the rest of the world we need to find out more about. Overall this is an excellent product. 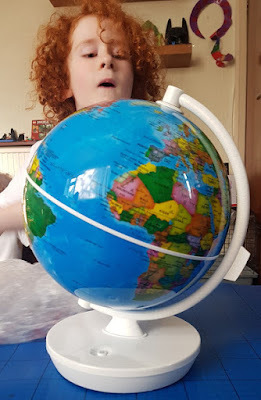 My son is absolutely delighted with his globe, he's already used it for practical reference as well as for exploring his world. He uses it as a bedtime light and it's a fascinating for everyone - I'm always drawn to have a look before I turn it off at night. You see something new or realise a fact you hadn't previously, every single time you look at it. 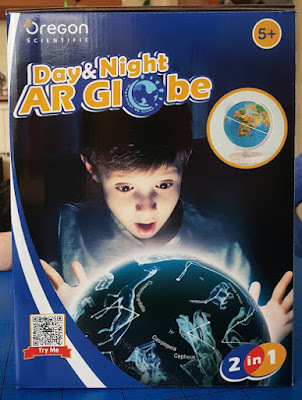 The SmartGlobe Starry 2in1 Day & Night Globe is made by Oregon Scientific and recommended for children aged 5+. Available to buy now priced £29.99. An excellent Christmas present for any primary school-aged child with an interest in space, maps, dinosaurs or who simply soaks up information like a sponge. They can learn a lot without it ever being a chore. 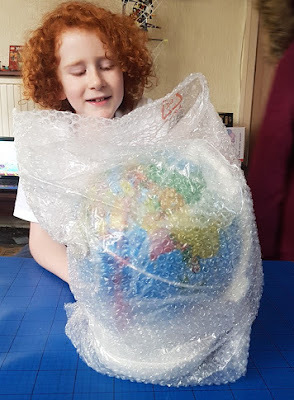 We were sent our globe for review.